In an elevated position on the southern tip of the Island, these two delightful properties command stunning views over the Ayrshire and Wigtownshire coastlines, westwards to Ireland and beyond. The cottages are semi-detached, but offer complete peace and privacy. These newly renovated properties have a spacious layout which has been very well designed to result in two individual and very stylish homes. Each has a patio and fenced private garden. Situated in a very peaceful location amidst idyllic countryside. Previously a farm cottage, built around 1880/1890 it has been renovated to a high standard but in keeping with its original character. 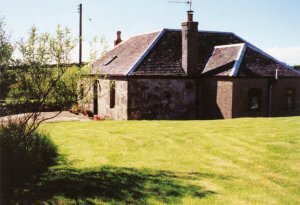 It has its own garden with views westward to the Argyll peninsula and south to Ailsa Craig and beyond.